Transparency is essential to a fair and equitable criminal justice system. Knowing how we handle criminal behavior and dole out punishment allows the public to hold law enforcement accountable. The use of confidential informants, however, can pervert that premise in many ways. "We rely on such information to monitor whether the criminal system is effective and fair — in individual cases as well as more broadly," Alexandra Natapoff writes in her book on confidential informants. "Taking such information off the public record thus bolsters law enforcement authority while reducing the ability of legislatures, the press and the public to evaluate executive actors and hold them accountable." Natapoff, a professor at Loyola Law School in Los Angeles, is considered one of the nation's leading experts in the use of confidential informants. She has testified before the U.S. House Judiciary Committee in 2007 and had a hand in writing legislation in Florida known as Rachel's Law, which was enacted in the wake of a young drug informant's death. 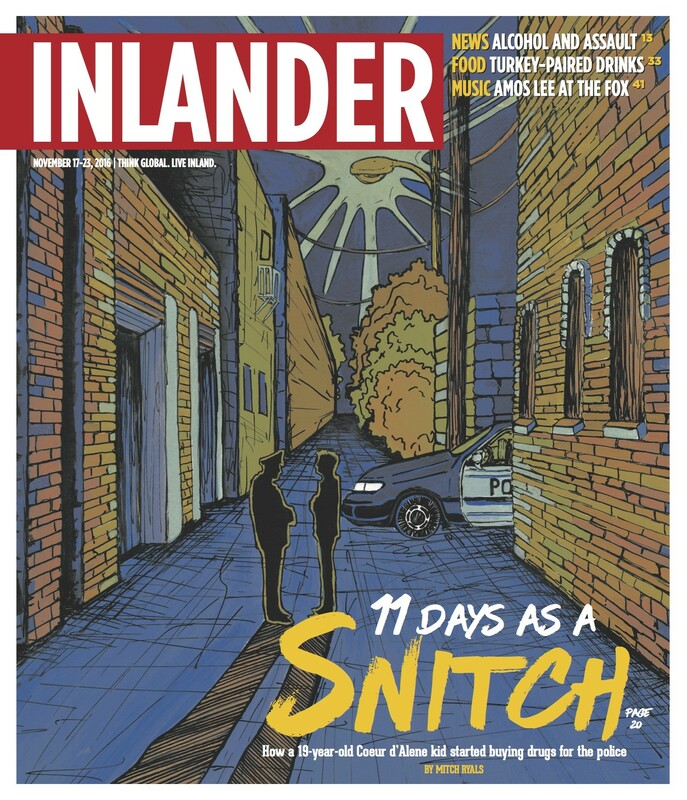 The Inlander spoke with Natapoff for our story about Isaiah Wall, a 19-year-old drug informant who ended up dead 11 days after he started working for police. 1. Constitutional rights are often excused in favor of keeping an informant secret. • The Fourth Amendment protects against unlawful search and seizure. That means, generally, police need a warrant and a judge's signature for permission to enter a house or listen in on a private conversation. A confidential informant wearing a wire, however, does not have to jump through those hoops (though some states have barred warrantless use of informants in this regard). • The Sixth Amendment guarantees defendants the right to confront any witnesses against them. With informant witnesses, judges have chipped away at this right, in some cases allowing prosecutors to keep informants' identities a secret. In 2002, it appears the Ninth Circuit Court of Appeals tried to strike a balance by allowing a confidential informant to wear a "wig-and-mustache disguise" on the stand. • And for cases that don't make it to trial, prosecutors are under even less obligation to show their hand. The 14th Amendment guarantees defendants due process, which includes a right to know all the evidence the state has, including evidence that could discredit the state's witnesses. For snitches, that evidence could include criminal history and any benefit (such as leniency for their own crimes or cash) they receive in exchange for cooperating with law enforcement. However, the U.S. Supreme Court ruled in 2002 that defendants are not entitled to that information before trial. Specifically, the court was concerned that revealing those details "could 'disrupt ongoing investigations' and expose prospective witnesses to serious harm.'" That's significant, Natapoff says, considering that about 95 percent of criminal cases end in plea deals. That means most defendants are pleading guilty without knowing if the evidence against them is completely legit. On the other hand, police and prosecutors' concern for confidential informants is not misplaced. Informants nationwide end up beaten, tortured and dead once they're found out. Put crudely: snitches get stitches. 2. The War on Drugs is the engine driving informant use. In 1995, decades into the war on drugs, lawyer and journalist Mark Curriden published an in-depth look at law enforcement's extensive use of informants by analyzing more than 1,000 federal search warrants from 1980 to 1993. In that time frame, warrants that solely relied on information from a confidential source increased by nearly 200 percent — from 24 percent to 71 percent. Although it's impossible to get an accurate number of informants in the U.S., a recent audit of the DEA's CI program cited more than 18,000 active confidential sources from October 2010 to September 2015. However, that same report found that "the DEA did not appropriately track all confidential source activity." 3. The risk for abuse is high. Take, for example, the case of four NYPD cops, who for decades have apparently fabricated sworn statements and arrests with the help of fictitious informants. A State Supreme Court judge in Brooklyn called one of the detectives "extremely evasive," and did not find him "to be credible." A judge in another federal case remarked: "I believe these officers perjured themselves. In my view, there is a serious possibility that some evidence was fabricated by these officers." Investigations by the NYPD and the Brooklyn district attorney determined the cops did nothing wrong. Three of the four (one is retired) are back on the streets. In a separate example from Atlanta, officers facing pressure to make their quota of drug arrests killed a 92-year-old woman after they busted down her door on some bad information from a snitch. Police then tried to cover their tracks. They called another informant and asked him say he bought drugs from the house where police had just killed the elderly Kathryn Johnston. The second informant, Alex White, rolled on the police, and exposed their cover-up. The three cops involved in the death and cover-up eventually pleaded guilty. They received sentences of five to 10 years in prison for charges ranging from planting evidence to perjury to manslaughter. "Given the reality that informant deals are baked into the criminal justice system, we are obligated to better regulate it," Natapoff says. "We have fallen down in that regard. We have given such broad discretion to police and prosecutors and failed to create transparency and accountability mechanisms that would give us the confidence that these deals are being made in responsible ways."